The Rexel Mercury RSM1130 is a micro-cut shredder that shreds paper into approximately 2000 tiny 1.9 x 15mm pieces. This gives it a P-5 security rating which means it is suitable for shredding both highly confidential and secret documents. Designed for use in a small office environment with up to 5 users, the RSM1130 shreds up to 11 sheets of 80gsm paper at a time. 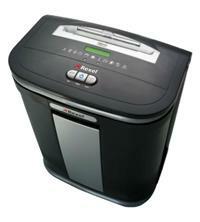 The shredder also has a 30 litre bin capable of holding up to 310 shredded sheets. In addition, recyclable bags can be used with it, Rexel product code 2102063. Handy features include jam-free technology (meaning it will only shred stacks of paper within the shredder’s sheet capacity), easy to use controls and an auto-lubrication system (simply ensure you change the shredder oil when prompted, Rexel code 1760049). Please note that this shredder will shred paper only – it doesn’t shred staples, paper clips, CDs or credit cards.